South Africa rewrote its nationality law after the end of Apartheid in 1994 and the establishment of majority rule in the country under the African National Congress. The 1995 South African Citizenship Act did away with the previous Apartheid-era 1949 and 1970 acts which had established separate bantustan citizenship to the country's African majority and inferior levels of citizenship to the country's Asian and coloured minorities. There is an exception to the birthright citizenship provision: those born to visiting foreign diplomats or their employees, or nonresident aliens are not considered to be "citizens by birth" (unless their other parent is a citizen, in which case they are a citizen by birth). Under the 1995 law, a person born outside South Africa to a South African parent is a South African citizen by descent upon registration of the birth under South African law. Those who did not retain their citizenship after they applied for another citizenship cannot transmit their previously held citizenship. Have adequate knowledge of the duties and responsibilities of a South African citizen. Naturalisation of an adult also confers South African citizenship upon that adult's minor children. Naturalised South Africans who left South Africa before 6 October 1988 and did not obtain a 'Letter of Exemption' from the South African authorities may have lost South African citizenship after seven years absence. Visa requirements for South African citizens are administrative entry restrictions enforced by the authorities of other states placed on citizens of South Africa. In 2017, South African citizens had visa-free or visa on arrival access to 98 countries and territories, ranking the South African passport 55th in the world according to the Visa Restrictions Index. Presently, South African citizens have visa-free or visa-on-arrival access to 103 countries, according to the February 2018 score ranking, the South African passport is 53rd in the world. There are many exemptions for South African citizens in lieu of obtaining a visa if in possession of an Exemption Document, see Visa requirements for South African citizens. Dual Nationality does not necessarily refer to two citizenship, it can mean more than that. The definition dual-Citizenship in international law is the base for obtaining MANY citizenships. If, for instance, a person is granted Irish-South African Citizenship AT birth then later on moved to New Zealand, they can obtain New Zealand Citizenship should they wish. This is a common misinterpretation. It is beyond understanding how the Home Affairs find most of the citizens who obtained another citizenship. Prior to 2004, South Africa in principle did not recognise the multiple citizenship of its nationals unless the citizen applied for an exemption or permission letter under a 1995 law permitting South African citizens to travel using foreign passports. Since 2004, South African dual nationals may travel without hindrance as long as they enter and leave South Africa on their South African passports. Dual nationals may petition for temporary, emergency or "permanent" South African passports for this purpose. However, a South African citizen who by a formal and voluntary act acquires the citizenship of another country, automatically loses his or her South African citizenship unless they apply for, and receive permission to retain their South African citizenship before acquiring the citizenship of the new country. A naturalized citizen however cannot apply for such a retention under the law. There is not a specific requirement to do so if residing in South Africa or if the claim is inevitable such as a dual Zimbabwean-South Africa possessing the Right of Abode in the UK then registering as a British Citizen but it is advised by the Department of Home Affairs. The Home Affairs has the responsibility to decide whether or not the application would meet by a Voluntary or Formal and decide on whether or not it is necessary to give that permission. If a South African Citizen wishes to restore a previously lost Citizenship (usually by birth in another country or of their ancestors) due to acquiring Citizenship of another country, for instance citizenship of one of the territories that the Soviet Union controlled, then it is not a Voluntary or Formal Act when applying and retention of South African Citizenship is not necessary. Do note: Upon the introduction of patrility, a concept colloquially known as the right of abode in the United Kingdom, A South African citizen cannot possess the Right of Abode in the United Kingdom as they were not Commonwealth Citizens in 1983 unless they are a Commonwealth Citizen of another country, however if due to registration, British Citizenship and the Right of Abode is given simultaneously. South African citizens under the age of eighteen (18) years are exempt from the retention requirement and do not require permission as long as they acquire the foreign citizenship before their eighteen (18th) birthday by their parent's right or application. They automatically retain their South African citizenship for life unless; once they have reached the age of 18, they wish to acquire a further foreign citizenship. They will then have to apply for prior permission to retain their South African citizenship – failing to do so, they will automatically lose their South African citizenship. These laws are not heavily guarded thus entering South Africa with a South African passport will immediately suggest the holder's citizenship. Entering South Africa on a foreign or another country’s Commonwealth Passport is illegal when in the possession of South African citizenship. If the holder is assumed to have renounced their South African citizenship because there is no evidence to suggest that they are ‘presently’-'once were' South African, then they may pass under the assumption of another state/ that citizen but when it seems that they are a South African citizen, then may they face interrogation when entering or leaving South Africa when entering on another passport. An example of a person still holding South African citizenship to the officer would be: a person (generally above 18) seeking entry with a British citizen passport describing them as above 18, having been born in Republic of South Africa and the person’s passport states birth as Johannesburg, but the Home Affairs Officer detects that they last entered on a South African passport by an unknown method. This provision of the Citizenship Act (section 26(B)) only applies to adults ("major citizens"). However, children must also enter and leave on a South African passport. Those who previously held South African citizenship (other than by naturalization) are always entitled to permanent residence in South Africa and may apply to resume (naturalize) their South African citizenship after indefinitely returning so long there is sufficient proof of previously held South African citizenship. The permanent residence holder will then be required to reside in South Africa until (they) become eligible to restore or naturalize as a South African citizen. The application for resumption of South African citizenship requires proof of residence in South Africa for one year immediately prior to the application. Municipal rates and other utility bills are usually accepted. Resuming South African citizenship within South Africa after losing by gaining another citizenship by a voluntary or formal act after living for one year in South Africa Permanent Resident can be a lengthy task, thus all ACTION must be taken to avoid the loss of South African citizenship entirely. Should a parent choose make an application to resume, their child will not automatically become citizens. If the child entered in immigration exemption or clearance then later on as a dependent of the permanent visa holder (the parent), then they can later naturalize after a five years residence or after they turn 18, whichever comes first. However, the child could be subject to the one year residence requirement under certain conditions. Those who naturalized after obtaining permanent residence (South African citizenship not by birth or descent or registration) cannot apply for permanent residence then citizenship through their claim to previously being a South African citizen as previously stated unless (they) re-reside in South Africa on a pathway to possible permanent residence with an eligible visa again. This is not applicable to those who were born in South Africa or the UK and former colonies or obtained their citizenship by descent and have since lost it. Many South Africans have claims to another citizenship, in particular Jews' ancestors who came from the Baltic region or those who were deported from Germany during the Second World War and deprived of their German citizenship and possessions. There is a huge Irish community who declares themselves Irish but do not know they are entitled to an Irish passport by an application. (see: Demographics of South Africa). Prior to 1 January 1949, present day South African citizens of the former Union of South Africa (whilst it was part of the Crown's Dominions) were regarded as British subjects under British Colonional law (1910-1948) and were British Subjects of the individual colonies that formed the Union prior to 1910, both for the dominion and colonies, irrespective of how they acquired Citizenship, whether born in South Africa or some other territory or country in the British Empire including the UK itself. British Nationality Law expanded after this time of which many former Dominions developed their own Nationality Acts including South Africa. See British nationality law. Between 1 January 1949 and 1 September 1949, South Africans remained British subjects without citizenship even if they had already acquired citizenship of the UK & Colonies or of another British Commonwealth country and continued to possess a British Passport for the Union of South Africa with the status “British Subject” endorsed. Before this period, many dominions had already gained autonomy under the 1926 Balfour Declarations and then under the Statute of Westminster in 1931, a high level of self-governance acting almost as an sovereign country but within the Crown sovereignty. The term "Dominion" was conveived prior to 1926, thus the definition has changed throughout time, in particular from 1926, afterwhich all Dominions eventually developed their own Nationality Acts as a form of self-identity, most acts were enforced after 1948 (such as Canada). The British Crown's Dominions (e.g. : Canada, Australia, New Zealand, South Africa, and so forth...) operated their own Immigration laws both before and after 1949 but the Queen's Subject's commonly shared the Status of British Subject (until 1983) despite Nationality Laws having not been invented for most of them before 1949 which meant that *certain British Subjects from other parts of the British Empire required permission to land in other parts of the Crown's Dominions. All British Subjects from the Crown's Dominions then later the British Commonwealth Countries/ Realms (after 1949) could move freely between the Colonoies of the U.K. and United Kingdom until 1961. A Realm after 1949 is essentially what is known today as a Commonwealth Realm where Her Majesty the Queen, Elizabeth II provides for the Constitutional Monarch, however this differs from absolute Monarchy such as in the case of a Dynastic Rule in some Middle Eastern countries. Dominions and Realms are not comparable today, Dominions operated on a high level of self-goverence whilst they were controlled by the British Government in certain respects such as by representation in defence. On 2 September 1949, most British subjects without UK & Colonies Citizenship from South Africa acquired South African Citizenship if they had a connection to South Africa (e.g. Birth or Residence or by Descent), whilst simultaneously retaining the status of a British Subject of the Crown and being a Citizen of the newly independent South Africa part of the British Commonwealth of Nations as a Realm. The status acquired was British Subject: Citizen of the Union of South Africa/ Union National, a British Commonwealth Nation. Those who did not become South African generally became (citizens) of the UK & Colonies or remained British Subjects without Citizenship provided that they had no connections with any other Commonwealth Realm or the Republic of Ireland (Eire), but this was infrequent as citizenship acquisition was enforced upon the newly independent Commonwealth Nations for the British Subjects if they were eligible. Such persons (CUKC) would have acquired British citizenship in 1983 if they had the right of abode in the UK on the 31st of December 1982, otherwise they would have become British Overseas Citizens (BOC). Those who acquired BOC after as a result of their stand alone British Subject status (non-citizen) without the Right of Abode are likely British Overseas Citizens; prior to the revolution of the 1980s nationality act. British Overseas citizens and British subjects who have no other nationality, and have not lost or renounced another nationality since 4 July 2002, may register as British citizens under s4B of the British Nationality Act 1981 without requiring UK residence under certain conditions of the Act. This facility has been available since 30 April 2003 due to the statuses not having present day value and in particular British Subjects were there is no country of Right to Settle/ or of Permanent Residence. Those who have immigrated to the UK may have additional options for acquiring British citizenship such as naturalization through marriage or registration as a British Citizen in the UK which would enable the status to be transmitted by Descent. Between 1949 and 1961, all South African citizens remained British subjects by virtue of their South African citizenship whilst South Africa remained an independent Commonwealth nation, this was known as a Dominion prior to 1949, similarly in what is known today as a Commonwealth citizen under the U.K. Nationality Law. During this period South Africans were regarded as: [British Subject: Citizen of the Union of South Africa/ Union National, a British Commonwealth Nation/ Citizen]. The passport's format was similar to a CUKC passport and included the words “British Subject” inside as with all Commonwealth realms at the time. This was ended in 1961 when South Africa left the British Commonwealth on becoming a Republic, and formally abandoned all of its connections, with Union nationals becoming citizens of the Republic of South Africa. By the time South Africa returned to the Commonwealth in 1994, the phrase "British Subject" had been replaced by "Commonwealth citizen". Australia was the last to phase out British Subject in the Citizenship law which was in 1986. The full title of a South African citizen presently is: Republic of South African Citizen, a Commonwealth Citizen either * with or without the Right of Abode in the United Kingdom (formerly British Subject). Since South Africa has not been a full member for the purposes of the Law, it is not possible for a South African Citizen to possess the Right of Abode in the United Kingdom as a status unless they were a citizen of another Commonwealth nation before the 1st of January, 1983 including the United Kingdom, in case the right can be established in the South African passport. Right of Abode is the right for its holder to remain in the UK indefinitely (indefinite relationship) without immigration control or restrictions as long as the right can be proved. It is viewed as a status greater than Indefinite Leave to Enter/ Remain (also referred to as Permanent Residency). Holders of Right of Abode (except British Citizens) must have a Certificate of Entitlement in their passport as proof that their right exists or describing them as a British Subject with the Right of Abode in their British Subject Passport or hold a British Citizen (ROE co-exists with British Citizenship). Those who hold the ROE as a stand-alone status without Citizenship of the United Kingdom must be a Commonwealth Citizen, also applicable to some (British) Nationals which include some British Subjects and some British Overseas Citizens. All British Citizens have the ROE, however ulike British Citizenship which contains the Right of Abode regardless of personal circumstances, the Right of Abode as a Commonwealth Citizen including some forms of British Nationality can be revoked in cases such as in criminal conduct or applications made in fraud which are assessed incorrectly. As South Africa was a foreign country (under United Kingdom law) between 1 January 1973, the date the Immigration Act 1971 came into force in the UK, and 1 January 1983 (when the British Nationality Act 1981 came into force) South African Citizens cannot have right of abode in the UK unless they also held before 1983 and still hold citizenship of another Commonwealth country (such as by descent from their parent, e.g. Australia or Zimbabwe which did not cease to be Commonwealth Nations under U.K. Law) or of the UK itself, the holders would most likely have acquired that Citizenship by descent from a parent who was a Citizen of that Commonwealth Country at the time of their birth or through marriage. A Present Day Commonwealth country refers to any country within the Commonwealth of Nations, for instance, Australia, New Zealand or Canada. Since Queen Elizabeth II is not the head of state in South Africa (Queen/ monarch), as South Africa is a Republic, the Queen is the head of the Commonwealth of Nations only and is not the Constitutional Monarch which is the case for systems of the Monarchy for 16 of the Commonwealth nations which are known as realms (including the United kingdom). This particularly affects South Africans born before 1983 to a British mother, who would have otherwise acquired the right of abode in the UK on the 1st of January, 1983. Many South Africans possessing Zimbabwean Citizenship have the Right of Abode if their mother was born in the UK prior to 1983 even though Zimbabwe is not part of the Commonwealth under their own laws, but has since applied to re-join or “re-establish” the connection. However, the changes to British nationality law on 30 April 2003 have since allowed those born in South Africa between 8 February 1961 and 31 December 1982 to a UK-born, naturalized or registered citizen mother to apply for registration as a British citizen (by descent) [which is a less regarded version of British Citizenship by Birth or Naturalization or *some registrations] and with this comes the right of abode in the UK as British Citizenship coexists with the Right Of Abode. This could also enable Citizenship to be passed onto the Grandchildren in various circumstances. This concession is not specific to South African citizens, this applies to all countries including non-Commonwealth realms and members such as the United States and its territories. It remains very difficult to obtain many documents from South Africa's Department of Home Affairs for registration. Nationality was not considered something of great significance prior to 1983 (before many governments enforced major immigration changes), nor was this communicated by the U.K. Government frequently unless enquired about usually from the High Commissions. Travel was limited from South Africa due to strict laws imposed by the Apartheid regime, thus many individuals have misplaced their documents which could very well have helped many apply for Registration as a British Citizen by Descent today, many also never requested them. For those with a UK born mother, it is important to note that applying for a UK Visa is particularly difficult as South Africa was not always part of the British Commonwealth although is part of the new Commonwealth. The individuals affected are those born to British mothers between 1961 and 1982. The rule of who can possess the Right of Abode is very controversial but in most instances, those who apply for a Visa will generally have their applications refused. Those who later apply for a Certificate of Entitlement as an alternative entry method will also have their applications refused which then leaves them in a difficult situation whereby both the Certificate of Entitlement and UK Standard Victor Visa (C) are usually refused due to the officer not being aware of these restrictions when a British-born mother is mentioned in applications. Therefore, it is imperative to make a claim to register as a British Citizen by Descent if born to a British Mother prior to 1983 to avoid any travel complications. The only associated cost is the Certificate of Citizenship collection of £80.00 as of September 2018. Registration as a British Citizen by marriage is also one of the common ways to register if married to a British man prior to 1983. 1) +The parent of the child has the Right of Abode and is some form of a British National (e.g. British Citizen) by descent and has spent 3 years in the UK either prior to their birth or before their 18th birthday which would allow their minor child to become registered through the child's grandparent as long as it is within a specific timeframe (must be registered before the child turns 18), child does not have to live in the UK. 2)There is substantial proof that the Grandparent is/ was a British Citizen, their child was either born in a former Colony (between a certain number of years) or did not possess a passport, this will ultimately enable the grandchild to apply for British Citizenship by Registration but the law makes it unclear whether the parent would first have to be British / obtain or possess th ROA. This would essentially confer British Citizenship by 'Double Descent'. 3) Another way is if the mother registered before 1983, the child could potentially become registered. 4) There is the possibility for a child to become Registered as a British Citizen from their British Grandfather if the child's parent became British by Descent at birth automatically but was not able to register her child's birth at the High Commission due to discrimination in the past: the ability in the case: Grandfather whose female child had a child can apply to register. 5) Children born prior tp 2006 to an unmarried British father can Register as a British Citizen. Registration: The term registration refers to gaining British Citizenship where it was previously not available (obtained). Registration of different forms can make one a Citizen by Descent, by Marriage and even by Double Descent in some instances, and so forth. Since claims by double descent are very difficult and require an explanation, the UK Ancestry Visa was introduced (read below); this enables the acquisition of Citizenship in the form of otherwise than by descent by Naturalization which can be transmitted by descent upon a successful application for British Citizenship after meeting the basic residence requirement of 5 year then a further 1 year as the holder of Indefinite Leave to Remain/ Enter, whereas Citizenship by Double Descent can only be transmitted in limited circumstances. +Registering as a British Citizen can sometimes assist the child of the grandparent to become British as Registration generally refers to (otherwise than by descent). Naturalization is a process of becoming a British Citizen after meeting a residence requirement of 5 years, then a further one year as a ' Permanent Resident' which differs from registration where there is generally no residence requirement. As for people born on or after 1 January 1983, they can only possess the Right of Abode to the United Kingdom if they hold British Citizenship. If South Africa had remained a Permanent Member of the Commonwealth, those born prior to 1983 to British mothers would have possessed the Right of Abode however, those born after 1983 are British Citizens by descent and can choose whether to have a Certificate of Entitlement in their South African (Commonwealth) Passport or hold a British Passport irrespective of the fact that South Africa became a Commonwealth Nation again in 1994 (period of rejoining), women could only pass on their citizenship after 1983. Much of what is seen above is based on previous gender discriminatory laws where children could not enjoy the same rights had their father's been British at the time of birth and is a summary only. This is a five year's entry clearance (visa) which enables the holder to eventually apply for Indefinite Leave to Remain/ Enter (Permanent Residence) after five years of stay then eventually British Citizenship after a waiting period of one-year by Naturalization, which is in total 6 years of residence. Children (minor) of the qualifier are encouraged to join the UK Ancestry Visa holder as a dependent prior to their eighteenth as they will not be able to join the qualifier in the UK at the age of majority and will therefore be required to make their own method of entry unless they decide to join their parent's by switching from a Visa other than the Standard Visitor Visa (whilst in the UK) or whilst the parent is a Permanent Resident which is on an unlimited-time Family Visa, the child could become a British Citizen as well at a later date. There is no age restrictions for spouses. It is important to note that unlike other UK Work Visas, the Ancestry Visa cannot be revoked as it is ancestral right. Once the right is established, it is indefinite but the Visa will always need to be valid in order to use that right for entry/ re-entry into the United Kingdom of Great Britain and Northern Ireland. Thus, if a Five Year Entry Clearance/ Visa is approved, it will be the qualifier's responsibility to ensure that the visa is valid throughout the length (they) anticipate to remain in the UK and Crown Dependencies. Once the initial Visa expires, it can be extended whilst in the UK or a new Visa can be applied for outside the UK but the right would then need to be re-established (not applicable for extensions of visas from the UK). Border processing is less demanding when in possession a UK Ancestry Visa. the right to possess a British Emergency passport as a South African Citizen (Commonwealth Citizen) which is valid for one-year when there is no South African consulate or other Commonwealth consulate available. +A non-British Citizen from another Commonwealth Nation residing in the UK can simply vote. There are no specific concessions in terms of eligibility for British citizenship, and South Africans must meet the same rules for registration or naturalisation as citizens of any other foreign country. It was however possible for a citizen of the British Commonwealth (other than UK) to register as a British Subject: Citizen of the United Kingdom and Colonies (CUKC) prior to 1983 after 1 year's residence or even register without residing before 1961. South Africans that were in the United Kingdom after South Africa became a Republic were permitted to stay and even register as a CUKC. Those that left but did not register may have a Settled Status and can now register as a British Citizen. Those who do not have a Settled Status may apply for a Resident Return Visa if they are part of the Windrush Countries: Commonwealth Citizens that left the United Kingdom or never left. Since South Africa became a Republic in 1961 after a referendum was held by the National Party, more than 50% of the country ruled in favour of the pro-Apartheid majority Afrikaner National Party's interest of a new form of government, one completely severed/ free from the Commonwealth of Nations and the Crown and end all ties with it and the Queen, in order to avoid Crisitism from the rest of the world by having no connection to the Crown, but in particular to avoid further criticism from the Queen about her South African Government laws of segregation, this then later installed the fate of South Africa. South African Citizens (and other Citizens from the Commonwealth) before 1961 enjoyed benefits with the United Kingdom which included the free movement of Commonwealth Citizens entering the United Kingdom, the ability to apply for British Citizenship after a residence of one year, an equal status shared with British Citizens and other Commonwealth country's Citizens being British Subjects, now Commonwealth Citizens. Today, despite South Africa being in the Commonwealth as a Republic after it rejoined in 1994, it enjoys virtually non of these previous associations with the U.K. and other Realms such as Australia, Canada, Nee Zealand nor does it have the Queen as it's head as it used to. The working holiday two-year visa scheme was scrapped specifically for South Africa in 2008 due to rising concern. Before 1961 South African citizens could simply arrive in the U.K. without restriction as if it was a domestic trip from the Union of South Africa, passports were not stamped, etc. After South Africa became a republic it continued to have visa-free entry to the United Kingdom for a period of six months until 2009, after which the Home Office implemented visa requirements. 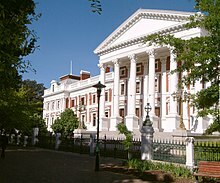 Had the National Party not implemented the Aprtheid policy in 1948 and then later become a Republic in 1961, South Africa would have continued to be the Union of South Africa and likely continued its strong connections with the U.K. and other Commonwealth Realms; it would have been a very different country today. ^ "South African Citizenship Act" (PDF). South African Government. ^ "UK Working Holidays – A Thing of the Past for SA". Web.archive.org. 20 November 2008. Archived from the original on 15 February 2009. Retrieved 13 June 2012.